The STOXX Low Carbon index family is designed to enable investors to decarbonize their portfolios, i.e. limit the exposure of their portfolios to climate-related risks, such as stricter regulations and physical damage, while participating in the low-carbon economic growth. 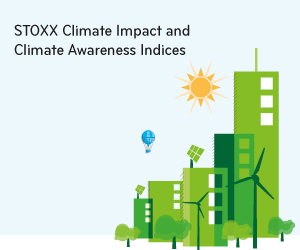 To cater to different approaches, STOXX developed fully tailored solutions based on broad index universes, with six sub-families offering varying degrees of carbon exposure.